What does it take to build a community solar project (with battery storage) in a small town in northern Minnesota when the monopoly wholesale energy company tells your small city-owned utility to “lawyer up”? Bill Schnell is the lead volunteer with the Itasca Clean Energy Team, a small group of active citizens in Grand Rapids, Minnesota, working to secure a community solar project for the town. He spoke with John Farrell, ILSR’s director of energy democracy, in January 2019, about building community support for the project and overcoming the objections of Minnesota Power, the electricity supplier to the small town’s city-owned utility. John Farrell: What does it take to build a community solar project with battery storage in a small town in northern Minnesota, when the monopoly wholesale energy company tells your small city-owned utility to lawyer up? Bill Schnell is the lead volunteer with the Itasca Clean Energy Team, a small group of active citizens in Grand Rapids, Minnesota, working to secure a community solar project for the town. He spoke with me in January 2019, about building community support for the project and overcoming the objections of Minnesota Power, the electricity supplier to the small town’s city-owned utility. I’m John Farrell, director of the Energy Democracy Initiative at the Institute for Local Self-Reliance, and this is Local Energy Rules. A podcast sharing powerful stories about local, renewable energy. John Farrell: Bill, thanks so much for joining me. Bill Schnell: Very glad to be here. Thanks for the invitation. John Farrell: So, I want to start off by just giving some context. Minnesota has led the country in community solar installations, and that’s a process where participants can subscribe to a share of a solar array that’s located nearby. So, it’s not on their own rooftop, but they’re owning a portion of a solar array that’s nearby and sharing in that renewable energy. What has made community solar an interesting pursuit for folks in Grand Rapids, Minnesota, where you are? Bill Schnell: Well, I think a lot of what attracts people initially is the idea of providing locally-produced renewable energy and thereby reducing our community’s reliance on fossil fuels. Also, community solar has the advantage compared to rooftop stuff of being available to anybody. My roof faces the wrong way and I’ve got big pine trees on the sunny side anyways. Community solar lets it be available to all, even if you rent the place where you live. And there’s no hassle. You don’t have to arrange for a contractor or get materials, get the permits. We’re foreseeing here a “pay-as-you-go” subscription model, so there’s not a big investment required up front. And people are going to be able to drop out of the program at any time, if their situation changes or they move out of the area. Also, you can lock in your energy costs at today’s price, and [since] you can always expect those prices to go up in the future, and in the long-term you’re going to save some money on the deal. John Farrell: Bill, tell me a little bit more about who has been involved in this community solar project with you. Who is it in the community that’s been interested in it? Who are you working with in order to try to make this project a reality? Bill Schnell: The members of our team are a fairly small group. There’s seven active folk, currently. It’s a mix of folks like myself with a natural resource background. I was a forester in my working life. There’s a retired nurse, former teachers. It’s a diverse group. What we share in common, I guess, is this real interest in trying to take some action locally to address climate change. John Farrell: You mentioned already some of the advantages of community solar in terms of reducing fossil fuel reliance, helping folks participate in solar who might not have a sunny rooftop. But this project has potentially some significant cost savings for both participants that you alluded to, and for the utility through the city’s municipal-owned utility company. What other benefits are you seeing being discussed as part of doing the community solar project? Bill Schnell: Well, there are several. I think the first one I would toss out is just the efforts we’ve made. We’ve been at this for three years now, tabling at events at the county fair, get the word out in any way we can to stimulate discussion in the community about choosing where our energy comes from and ways we can conserve energy. It puts attention on the utility’s existing load management programs. You can sign up for off-peak heating or air conditioning and save some money there. There’s some spinoff benefits from the project itself. The site, we’re planning to have a pollinator garden underneath the panels. We want to partner with our local community college and the school board in order to maximize the educational opportunities that having a working array in your community can offer — STEM classes talking about the renewable energy jobs of the future. And the array itself is going to be visible in the community, and it brands us, I think, as a forward-thinking place to live. John Farrell: One of the things I thought was really interesting in learning more about your project was that the technology isn’t quite the same. So, most community solar projects are a megawatt of solar panels, enough to power maybe 200 homes. But this one includes energy storage from batteries. How does adding that component to the project make it better than some of the existing community solar projects? Bill Schnell: Boy, that was a big plus for us. We didn’t start off thinking about storage as a component either. When we were in that mode, we’re trying to always decide, well how many subscriptions can we sell? Well, it depends on how big the array gets to be. Well, how big should the array be? Well, it depends how many subscriptions you can sell. But with storage, it gives the utility a real reason to want to do the project because we’ve learned a lot about energy in the process here, and the wholesale cost of energy at any given time depends on the load on the system. And these demand charges … Your energy bill, when you get it … At least when I get mine, there’s two pieces of it. There’s a base rate for the energy you used, but there’s also a demand charge and that reflects the utility’s cost of power throughout the day and throughout the month. The demand charges that we pay each month here are based on the peak 15-minute interval. In other words, what’s the highest amount of energy that the city needs at any 15 minute point in time for the whole month? So energy’s pretty cheap in the middle of the night on a cool spring day. But in the heat of summer when everybody gets off from work and cranks up the air conditioning, that’s expensive power. In those lower demand times right here, the wholesale price to the utility is about four cents a kilowatt hour. But on that hot August afternoon, it’s $19 per kilowatt hour. So it’s just a huge difference, and that peak rate … That applies for that whole month. So, if you can shave that peak just a little bit, you’re going to end up saving lots of money, and the batteries allow you to do that. So, again, as I said, it gives you the utility really a compelling reason to participate in the program, and with that value to the utility, it reduces the pressure on our team to make sure that everybody buys a subscription. That the whole array gets fully subscribed, although that still our goal. So, I guess that’s about it. It just really makes the project more salable, and it also … Every time you roll out something like this in the community there’s early adopters and there’s folks who hang back, and there’s folks who frankly are never going to get on board. And the naysayers can really undercut a project. But if now that we have this information that, hey, even if you don’t subscribe, when we build this utility that is going to save money, it really takes the wind out of their sails. John Farrell: That’s really interesting. We’ve talked a little bit about the utility. Unlike most communities, Grand Rapids actually owns its utility company, it’s electric company. Although, there are 2000 of these municipal utilities across the country and several dozen in Minnesota. I was curious if the community ownership of the utility means that residents and businesses in Grand Rapids have an advantage in doing community solar compared to other places. What has that locally-owned utility meant in terms of this process? Has it made it easier, do you think? Is it harder? How has that played out? Bill Schnell: Well, the big advantage that, I guess I see looking back, is that it was really nice to have a local point of contact here. We started off going to the mayor and the city council when we first got organized, and then they spelled out to us that, well, the public utility piece of this is actually a standalone entity. And we got to meet the folks over there. We’ve developed personal relationships with each of the commissioners who are volunteers. It’s not like they get paid hardly anything for this. They get a little stipend. But we have relationships with them now and they live in the community, so we have some shared values and a desire to make things better for our town, our community. And I think if we were dealing with a corporate office somewhere far away it would have been a lot more difficult. John Farrell: We’ll talk more about the perils of dealing with a far away corporate office in a minute. But we’re going to take a short break to ask for a little help from our listeners. John Farrell: Hey, thanks for listening to Local Energy Rules. If you’ve made it this far, you’re obviously a fan and we could use your help for just two minutes. As you’ve probably noticed, we don’t have any corporate sponsors or ads for any of our podcasts. The reason is that our mission at ILSR is to reinvigorate democracy by decentralizing economic power. Instead we rely on you, our listeners. Your donations not only underwrite this podcast, but also help us produce all of the research and resources that we make available on our website and all the technical assistance we provide to grassroots organizations. Every year ILSR’s small staff helps hundreds of communities challenge monopoly power directly and rebuild their local economies. So please take a minute and go to ILSR.org and click on the Donate button. And if making a donation isn’t something you can do, please consider helping us in other ways. You can help other folks find this podcast by telling them about it or by giving it a review on iTunes, Stitcher, or wherever you get your podcasts. The more ratings from listeners like you, the more folks can find this podcast and ILSR’s other podcasts: Community Broadband Bits and Building Local Power. Thanks again for listening. Now, back to the program. John Farrell: What I’ve heard is that there have been some challenges in terms of moving this forward, and one of them has to do with the city’s wholesale power supplier: Minnesota Power. And just for some context, most of the 2000 municipal utilities out there are pretty small. Grand Rapids has a population of about 11,000, for example. There are some that are bigger. Rochester, Minnesota, for example, is about — around 100,000 people, a little bit less than that. Some are even smaller. So a lot of them will be buying most of their electricity from some larger entity and just then selling that to retail customers. And a lot of communities have big contracts or very long term contracts to buy that power. So with Minnesota Power, this is a big utility. It’s about 15 times larger than the city’s utility. Has it been a hindrance in that relationship? Or how has it been a hindrance, and what options does Grand Rapids have for dealing with Minnesota Power to make progress on this community solar project? Bill Schnell: Yeah, it’s a David and Goliath thing, for sure. You say 15 times larger. I think it’s way more than that. Their biggest customer are the taconite mines and the heavy industrial stuff on the range — the paper mill here in town. Grand Rapids is a pretty small player in that, and they distribute the power they buy from Minnesota Power. John Farrell: Minnesota Power has been aware of our team and our project almost from the get go three years ago. At one point in time we were talking with them about being a solar developer to build the array for the local public utilities commission here. They have a community solar program of their own. They built a megawatt array a couple of years ago, and they’ve had an online subscription process for that. I don’t think it’s fully subscribed even yet, although the part they set aside — half for residences and half for larger users. The City of Duluth and UMD (University of Minnesota-Duluth) have bought up the back portion of the array’s production right away. Bill Schnell: They’ve known about this all along, but now when we’re getting close to actually building it, they’ve come in to say, “Wait a minute. We’ve got language in our contract that says Grand Rapids, you can’t buy power from anybody else.” The contract allows the utility to produce some of it’s on power, 10% of its load, but to actually buy that power somebody else is not permitted. The public utility here said, “Wait a minute. That clause in the contract doesn’t mean that exactly.” We were looking at it in this way, but Minnesota Power has a big legal team and our local public utility does not. So, they have some leverage in terms of taking the thing to court and dragging it on for who knows how long and costing the city or the utility lots of money. So, there’s compelling reasons to make a deal. The deal is still in progress, I guess, being worked on, but the outline of it does appear to be clear. Minnesota Power has offered to step in and actually be the one that contracts with the solar developer to get the project built, and they would pass the power through to the public utility supposedly at no increased cost to Grand Rapids. But in effect, Minnesota Power would be doing the power purchase agreement with the developer, not the city. So, that’s where the thing stands right now. The local public utilities commission has gone along with that agreement. Seems [to be the] expedient thing to do. We’re hopeful that the process can continue along at a relatively quick pace. Spent a long time in developing, but we’re at the point now where we would like to be building it this summer. Especially since there’s an existing federal tax credit program that starts to phase out in 2020, so we want to make full use of those credits, if we can. There’s also an unresolved issue with Minnesota Power. They have a renewable energy mandate from the state. I can’t cite exactly the amount that applies to Minnesota Power, but I know they haven’t reached it yet, and they indicated they wanted the renewable energy credit for the system that gets built here. We think that’s inappropriate. They’re swooping in at the last minute, and they haven’t done any of the groundwork for this. So, there’s still a potential sticking point there. We’ll need to work that out going forward. John Farrell: That’s really interesting. I’m curious if you have a sense of what it is that Minnesota Power wants out of this. I can’t imagine that a community solar project is going to be a significant portion of the electricity that serves this community. That probably is not going to be more than that 10% you mentioned that the city would be allowed to produce on its own, and certainly it’s a tiny drop in the bucket, as you mentioned, compared to the energy that the utility is selling to taconite mines and paper mills and its other residential and industrial customers. Why do you think they care? Why is this an issue? Why do they want to use their team of lawyers to make this an issue, when it is really such an insignificant portion of their power supply? Bill Schnell: Well, they’re afraid, I think, of replication. As I said, talking about the battery storage component of this, it’s a no brainer, and if we built something like that in Grand Rapids here, there are lots of similar sized communities on the iron range and around the state that are part of Minnesota Power’s customer base right now, and many of them are interested. We’ve had some preliminary contact from some of these folks already. So, if other folks adopted our model and implemented it locally, then it would — could — amount to a significant amount of their revenue. That’s my take on it right now. John Farrell: Yeah, we often talk about the word market share and monopoly, in the work that we do around energy democracy, and it is one of the challenges now that as we see the technology has democratized. Right? You can have a community that can do its own solar generating facility and energy storage at a small scale, and it’s cost-effective, and, yet, we still have these utility companies that are vertically integrated, that own everything from the power plant to the transmission lines to the poles and wires to the meter on your house. It no longer seems to align as well with where the technology is at. So Bill, I’m curious — in the process that you’ve gone through to do this community solar project, and we’re hoping of course that you’ll be successful in both the negotiations with Minnesota Power and in getting this project off the ground while the federal tax credit is still available — What advice would you have for other small city-owned utilities, other communities on the range that, you said they’ve already been reaching out, for delivering community solar to their residents and businesses? How should other folks go about this, and what are the things that they should look out for? Bill Schnell: Well, I do think if it’s a utility-led enterprise that they should reach out and engage folks in the community. I know that our team has donated thousands of hours of volunteer time to the project in terms of educating people in town, getting the word out, doing some research. So, engage willing members of the community who want to help, and they are out there, I have no doubt. Also, you know, relating to the discussion we just had about Minnesota Power and their contract, it would be important to get clarity on what’s in that contract at the start of the process. You know, for Grand Rapids here, for example, they have had a contract with Minnesota Power. They had a working relationship for many, many years. 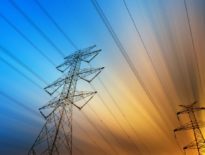 As infrastructure needs come up Minnesota Power will often offer to help with those endeavors, bear some of the cost in exchange for extending the power purchase contract with them, and the utility here has taken advantage of that over time. Right now, the contract runs out for another 10 years. But if you had a project in mind and you knew your contract was coming up for renewal, it would be an opportunity to make sure that there was room in that contract for a project like this without creating waves. So, getting clarity on the contract is helpful. Another point, obviously, you do want to include storage when you’re thinking about this. It’s more than just solar panels anymore. Battery prices are coming down every week, every month. So, storage is helpful. You may as well learn from what other folks have done, so do some research. There’s innumerable solar — community solar — systems out there. We have had really good input from some other folks. I’ll just give a shout out to Sterling, Massachusetts. They have an excellent system there that includes battery storage. They’re the ones that really proved to us how valuable that can be, and there’s lots of information online about their program. Cedar Falls, Iowa, is another one for towns our size. Cedar Falls is a little bit bigger, but we got a lot of helpful information from them, and the folks down there are very happy to share what they have learned. So, take a look at what other folks have done. As we got into it and did our own research, our team felt like we thought we knew what we needed in terms of program design, but staff at the public utilities here said, “Well, this isn’t really our field of expertise. And as a utility, we think we should hire a consultant.” So they went through a process and hired a firm with a national reputation to assemble a program design for our local situation here and that has been so helpful. Not every utility has the same economic factors at play, the same economic capacity, household income. Lots of criteria were pulled together to find a system that meets our needs pretty well. So, a customized design is something I strongly recommend. And then finally, it would be good to start your process soon because as we’ve alluded, those tax credits are starting to go away. The longer you wait, the more expensive stuff is going to be in that aspect. John Farrell: Well, Bill, we wish you the best of luck with your project pursuits in Grand Rapids, and I think as you’re talking about lessons that other folks can follow, we hope that this podcast will be a helpful way that people can learn more about the efforts that you’ve been making in Grand Rapids and how they might do that in their community as well. So thanks again for taking the time. I really appreciate it. Bill Schnell: Sure, no problem. And we have a website, GrandCSG.com, where you can go for more information. John Farrell: Terrific. Bill, thanks again for joining us. Great to talk to you, and best of luck. Bill Schnell: Thank you very much. It’s been fun. John Farrell: This is John Farrell, director of ILSR’s Energy Democracy Initiative. I was speaking with Bill Schnell of the Itasca Clean Energy Team in Grand Rapids, Minnesota, about his community’s efforts to develop a community solar plus storage project. You can read more about the challenges of developing community-owned renewable energy in our 2016 report Beyond Sharing, available for free at ILSR.org. You can also see which states have the most supportive policies for community renewable energy in our annual scorecard based on ILSR’s interactive Community Power Map. While you’re at our website, you can also find more than 50 past episodes of the Local Energy Rules podcast. Until next time, keep your energy local and thanks for listening. Like most communities that have pursued community solar, there are several common interests. Bill and other Grand Rapids residents want locally produced renewable energy and reduced fossil fuel reliance. They’re attracted by the opportunity for anyone, with or without a sunny rooftop, to lock in energy prices for decades. They also like the program structure that allows customers to go solar with a minimal upfront investment and to drop out easily, and that spares participants from having to negotiate with a contractor themselves. Who is Leading the Community Solar Effort? Bill is a volunteer with the Itasca Clean Energy Team, a relatively small group with seven active members that have been working on community solar for years. Bill is retired after years of working for the state’s Department of Natural Resources. Several of his collaborators have a similar background, but there’s also a retired nurse and a few former teachers, all motivated to make climate action local. Bill and the Clean Energy Team anticipate several benefits for participants in the program. The most obvious is the potential to save money on energy bills by locking in a fixed price for decades, but Bill was most animated in talking about several other opportunities. The solar project will also incorporate a pollinator garden, and involve a partnership with schools and community colleges for educational opportunities. Bill also highlighted how having a solar and storage project in Grand Rapids is a branding opportunity, to show that the community is embracing the energy supply of the future. You can read more about the challenges of developing community-owned renewable energy in our 2016 report, Beyond Sharing, available for free at ILSR.org. You can also see which states have the most supportive policies for community renewable energy in our annual Scorecard, based on ILSR’s interactive Community Power Map. One of the biggest benefits is the project’s incorporation of battery storage, unlike most community solar projects built thus far in Minnesota or elsewhere. Prior to its inclusion in the project design, there were a lot of “chicken and egg” issues, such as trying to size the solar array and guessing how many potential subscribers they could line up. With storage, the project makes financial sense for the utility, regardless. When power is abundant on the wholesale market, its price is as low as 4¢ per kilowatt-hour, compared to $19 per kilowatt-hour when energy demand is highest on a hot August afternoon. The battery not only allows the utility to reduce its peak energy needs but also reduce ongoing “demand charges” that are based on the utility’s highest use within a month (based on a single 15-minute interval). 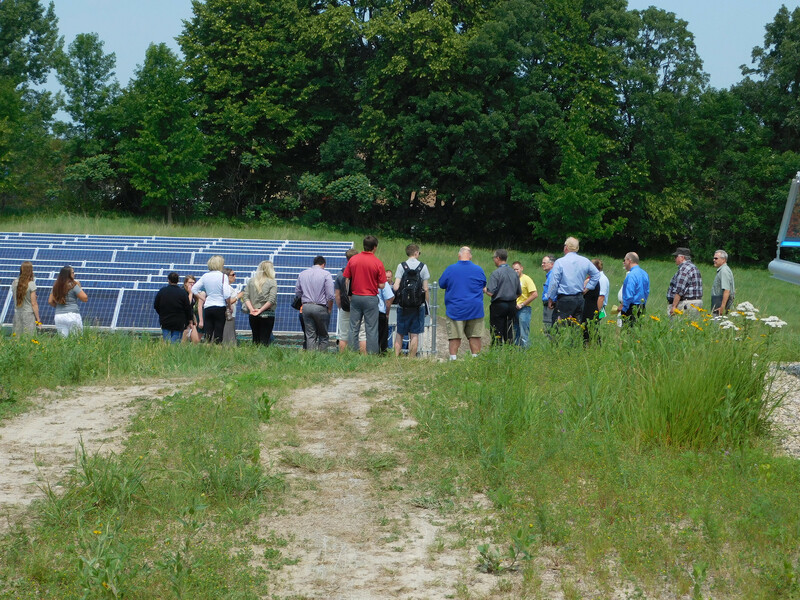 Click to learn more about the Grand Rapids Community Solar Garden. Like 2,000 other communities across the country, Grand Rapids owns its own electric company. Bill said that the local point of contact was helpful in getting the project concept moving because he and his fellow advocates were able to build relationships with the utility commissioners. “If we were dealing with a corporate office somewhere far away, it would have been much more difficult,” said Bill. Unfortunately, the project’s progress has been held up by a corporate office about 90 minutes away, in Duluth, Minn. Minnesota Power, the wholesale power supplier for Grand Rapids and a utility several times larger, has put the squeeze on the small town’s project. The Grand Rapids utility has an “all requirements” contract with Minnesota Power for its electricity. While the local utility is allowed to self-supply up to 10% of its needs, Minnesota Power has taken issue with the plans to use a third party to develop the project (and capture the federal tax credits, not possible for a nonprofit, city-owned utility). Minnesota Power has offered to be the power purchaser, instead of Grand Rapids, and to pass the electricity through without a markup. But the remaining hangup is that Minnesota Power wants to keep the renewable energy credits to comply with its state requirements. Grand Rapids would like to keep the credits. Bill suspects that Minnesota Power is also concerned about setting a precedent — that a lot of communities on Minnesota’s Iron Range would have an interest in replicating what Grand Rapids is doing. Start with community engagement, says Bill, especially if the project is utility-led. The Itasca Clean Energy Team has put in thousands of volunteer hours engaging community members. It’s also important to get clarity on contract language. Like many other small utilities, Grand Rapids has a contract with Minnesota Power that’s regularly renewed. Using these renegotiations is a key space to carve out space for community solar projects. Definitely include energy storage. Battery prices continue to fall, says Bill, and the financial opportunity is significant. And act fast, since the federal solar tax credit starts to step down at the end of 2019. Finally, Bill says to learn from others. 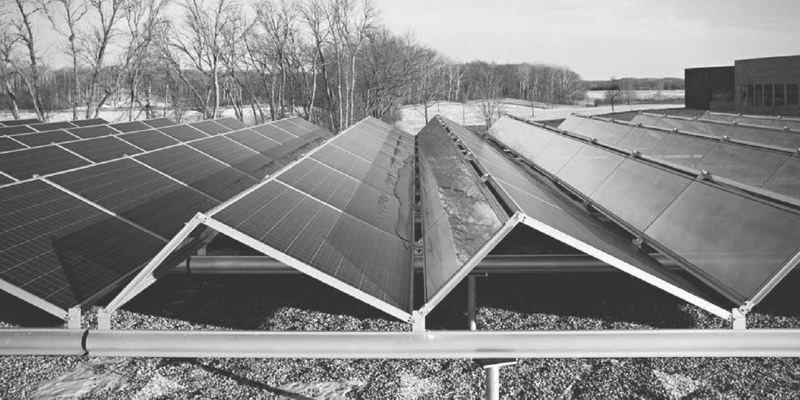 Grand Rapids folks were inspired by solar projects in Sterling, Mass., and Cedar Falls, Iowa. Both communities are similar in size. This is the 69th edition of Local Energy Rules, an ILSR podcast with Energy Democracy Director John Farrell that shares powerful stories of successful local renewable energy and exposes the policy and practical barriers to its expansion.